1. No infant insert. I didn't have one with Rowan, and so I couldn't really use the Ergo until he was a few months old. 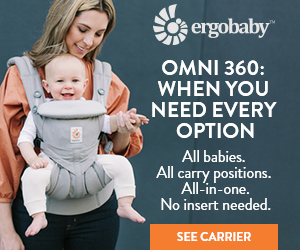 I currently don't even know where my ring sling is (during this home renovation), so I'm happy I can switch out between a Solly and this Ergo 360 now. All you have to do is narrow the width of the carrier to the inner buttons and fold down the top flap. Super easy. 2. FOUR different positions. The main draw to this carrier is that it can be worn 4 different ways - back, side, front-facing in, and most importantly provides an ergonomically correct front-facing-out option. This will carry you through all the newborn to toddler stages (7-33lbs). 3. Built in phone-sized pocket. Obviously not all dresses have pockets (for some reason that I know not of) plus all of the many days of leggings-as-pants as a mama... So I'm really happy to have the easy zipper pouch for phone/cards/keys already built in. No need to buy the attachment piece anymore and have another thing to remember and worry about (or misplace). I unfortunately didn't really use my attachment pouch much for that reason. Built-in fanny-pack for the win! All of this plus it still has the same great, supportive design and waist clip. I hardly feel any weight on my shoulders (a big problem area for me after having and nursing babies). 4. Ease of Use. “If you don’t use it, you lose it” is also a saying that could apply to wraps or carriers. If I haven’t used one in a while, I might be back to youtube to make sure I’m doing it exactly right. Luckily for Ergobaby carriers, they are mostly self explanatory. Revisiting YouTube or the manual may only be needed when adjusting for height or a new way to face your baby that you’ve yet to try. Once you have it adjusted, then all the following days you can just throw it on and GO. Depending on how flexible your arms are, the shoulder blade clip can be hard to clasp for front carrying when you’re alone… but you get the hang of it! Other Pros? You can cross the straps, and it doesn't have the loud velcro band like a previous version. Loud velcro and sleeping babies just didn't mix for people! The only cons I can think of is that there wasn't a way to face my alert, meerkat baby outward facing before she hit 5 months old. But she was a newborn, and I wasn't interested in damaging her growing hip joints... so this is a con about life - not the Ergo. haha! They're just doing their job with the guidelines. Heat. The only legitimate con I can think of is the heat factor, but I feel hot in the summer in basically every type of carrier I've tried. Please comment if you have found a carrier that doesn't feel hot with extra pounds of tiny human against you in the Alabama heat. It's like baby-wearing is just meant for perfect fall and spring weather. Price. If you already have an Ergobaby carrier like me from a previous child, it is hard to justify spending the extra $100+ on this new version. However, if you do not own one yet, this is a great one to buy. Especially if you are pregnant or still have a newborn, this will be a versatile carrier that can see you through a lot of stages. Style. If you only need a carrier for short bursts of time and care more about looking stylish, this is not the carrier I would pick. I mean, it’ll do. But if you needed one to wear with a formal dress at a wedding, this carrier wouldn’t win… unless you really prefer just a touch of hiking-chic with your formalwear. OVERALL THOUGHTS. This is a 4-star carrier in my book! Other than magically transforming into a fashionable, draped fabric like a ring sling or coming with a built-in air conditioner, there isn't much else it can't do -- no age or type of carry that it can’t eventually accommodate. That *eventually* part is important to note as I didn’t initially realize some of the age restrictions. I birthed a strange newborn who literally NEVER showed signs of over-stimulation by being carried around in our arms while facing out. She would also cry more when being held facing inward and would crane her neck around to see what was happening around her. I was so excited to use this carrier front-facing-out but then learned the suggested safe time for that is OVER 5 months old. This was a bummer at first, but she's passed that milestone now and is a happy little bird sitting in her forward-facing perch! She is just about to pass the weight milestone for a back carry, but due to her birds-eye-view preferences I’m worried that she won’t even be a fan. Regardless, it’s a great option to have eventually for a toddler or when you really need a better range of motion for your arms! Our home renovation/moving tasks would’ve surely been even more efficient had we been to that stage already. Front-carrying is great until you have to move a box, and then the awkwardness of those pregnancy days returns. Hope this review was helpful! Check out the helpful tips and instructions below! Can you see baby’s face? Keep child close enough to kiss and in view at all times.